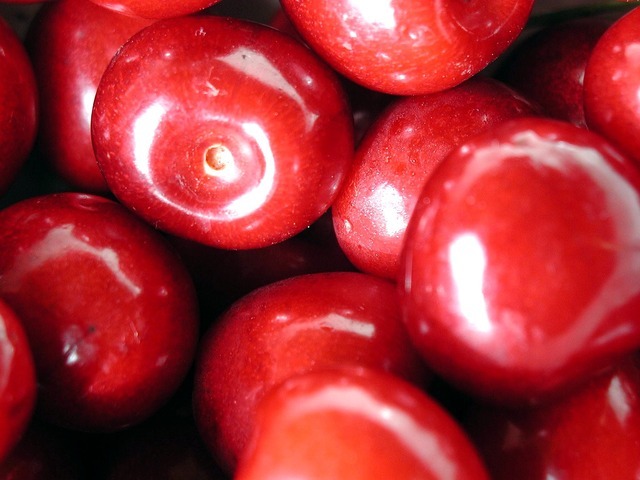 The cherry is a fruit that is consumed fresh or in cakes, mousses, jams and fruit stews. The larger cherries are usually the ones with better taste and texture. The cherry is a fruit with substantial medicinal and nutritional qualities. It is rich in vitamins K, A and C, and it also provides iron, calcium and phosphorus. It has a low fat content and no cholesterol. Its energetic value comes mainly from the carbohydrates. The cherry is specially appreciated by children. It is an amusing fruit because the bone it is very easy to remove and spit. This fruit, in the N hemisphere, occurs in summer. Out of season it is available in preserve. When we buy fresh sweet cherries, we must choose the heavy, dark red or black ones. In the case of acid cherries, we must choose the pale red or the pinky yellowish ones. In both cases, the stem should be well joined to the cherry. Cherries are consumed fresh or used as raw material for other foodstuffs such as cakes, mousse, sherbet, jelly, jam, stewed fruit or soft drinks. The cherry trees are great and straight, reaching up to 11m. The trees that bear acid cherries are usually smaller and they rarely reach 5 meters. In optimal conditions and only in certain regions they may reach 30 meters. They have an even trunk, from where the branches grow. The latter are thick in the case of the species Prunus avium (sweet cherries) and thin in the Prunus cerasus (acid cherries). They need another cherry species to be fertilized, since they are not able to do so themselves. The leaves of the sweet cherry tree are usually long, sawed and slightly hanging, whereas the acid cherry tree leaves are small, sawed and rounded. The differences are also perceived in their flowers, very white and large (2,5cm of diameter) for the sweet cherry tree and white, with 1,75cm of diameter in the acid cherry tree. The wild species fruits are round, small, black or red, sweet or acid according to the species. The characteristic that distinguishes the sweet cherries from the acid is, as its name indicates, the taste. The sweet cherries taste very sweet, whereas the acid taste strongly acid.